The probe should never disturb the loading of the furnace. 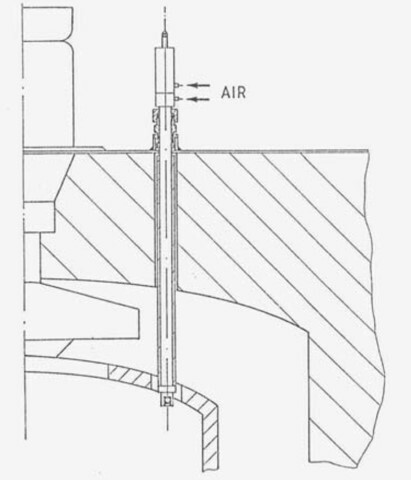 The probe should be placed as near as possible to the load for measuring the atmosphere and the temperature which have a direct influence on it; placing it next to a turbine will improve measurements. If the probe is placed too close to the heating elements or the door, the temperature control cannot be controlled correctly. A difference in temperature between the probe and the regulating thermocouple should be avoided. When installing the probe and during heat treatment thermal and mechanical shocks should be avoided (deterioration of the zirconia measuring element). No liquid or vaporised methanol should be sprayed against the oxygen probe (very heavy thermal shock). The consequences in such a case could be: fissures in the sensor, deterioration of the outer electrode and the metal seat, possibly a deformation of the metal tube or a rupture of the outter ceramic protection tube. If spraying of methanol cannot be avoided please consider our ZI probe with 35mm outter ceramic protection. The temperature of the measurement element must be between 600°C (1100°F) and 1050°C(1920°F)( (1700°C-3100°F for HT probe). The probe body must be held at temperatures of less than 60°C. The union that connects the probe to the furnace must be air tight so as to avoid ambient air penetrating into the furnace and causing variations in the oxygen concentration.